Admittedly I would have preferred an Ava Gardner or Rita Hayworth or Lena Horne chanting my name, perhaps all three, but you take whatever screen credit you can get in this town, even if it means changing a letter, capitalizing two others and dropping an article or three. I doubt I would ever make the effort had it been, say, Jerry Lewis. 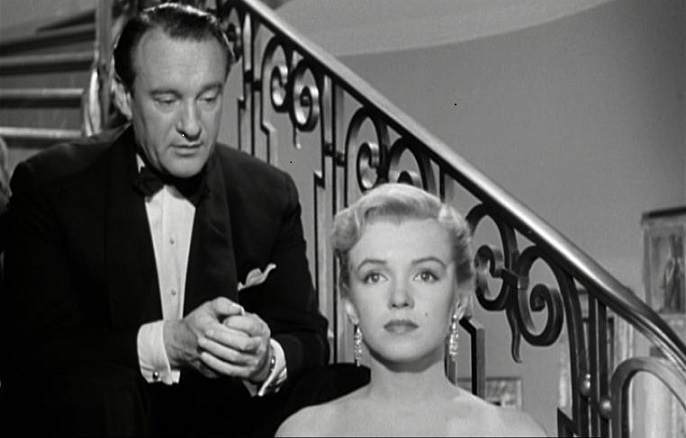 But there’s a cachet to George Sanders, who, after all, was the quintessentially loathsome critic Addison DeWitt in All About Eve (“You have a point. An idiotic one, but a point.”). As Brick’s Picks wore on I would slip into Addison DeWitt (“After Hef’s personal nurses revived us with smelling salts and feathers we remembered that pianist Josh Nelson is at the Blue Whale on Saturday.”) But even that wore thin. Night fell inevitably as he lay cooling, and with it another morning, and another night. He was cremated, and his ashes scattered over the English Channel, swirled about by the currents, reduced to molecules, and dispersed across the oceans at the speed of electrons. I wonder if any of the electrons that recreate him on my television now, chanting my name, were ever him. This entry was posted in Movies and tagged George Sanders, Village of the Damned. Bookmark the permalink. I never knew he committed suicide. That’s sad. I want to see The Ghost and Mrs. Muir.